The most photographed and most inspiring temples of Chiang Mai: Wat Suan Dok: built in a 14th century pleasure garden -- and Wat Chet Yot: built in 1447 by Lanna architects recently returned from Buddhagaya, the site of the Buddha's enlightenment in northern India over 2,500 years ago. Wat Suan Dok (the Flower Garden Temple) was originally built in the 14th century (1383) as a Thai monarch's pleasure garden. Legend says that its chedi contains one half of a glowing gem unearthed in Sukhotai by a Sri Lankan monk - the other half being buried in Doi Suthep. In the courtyard to the west, next to an elegant chedi built in 1372, is a garden of several resplendent white chedi containing the ashes of Chiang Mai's royal family. 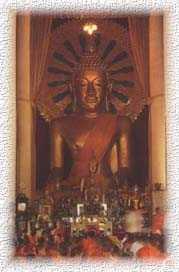 The 500 year old bronze Buddha image in a secondary chapel is one of northern Thailand's largest metal images. The temple is a favourite spot for photographers, due to its particularly striking sunsets.. The unusual seven-spired square chedi of Wat Chet Yot is a duplicate of the Mahabodi Temple in Buddhagaya, the site of the Budha enlightenment in northern India over 2,500 years ago. It was built in 1447 by Lanna architects on the order of King Tilokaraja. The 8th World Sangkayana (Doctrines revision - 8th World Buddhist Council) was held in this temple at that time - attended by more than 100 monks from various countries. 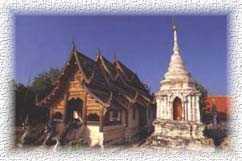 Unfortunately, the temple was damaged in 1566 when the Burmese invaded Chiang Mai. Chiang Mai National Museum (open Wednesday through Sunday) provides a superb overview of Lanna Thai Culture including works of art, war weapons and ancient Buddha images. Among its prize exhibits is a huge Chiang Saen-style bronze Buddha head 3m (10 ft) tall and a beautiful footprint inlaid with intricate mother-of-pearl. The museum also offers a varied assortment of Northern artifacts ranging from hilltribe costumes to implements used in hilltribes (cf.Doi Suthep Road) daily life. A steep road meandering for 12 km (7.5 miles) up the flanks of the mountain ('Doi') leads to Doi Suthep - the beautiful and cool location of Wat Prathat and the Royal Winter palace west of Chiang Mai. On the way, Kruba Srivichai Monument (which honours the "Engineer Monk" whose followers built the first motor road up the mountain in 1935) is a popular halting-place where you can pay your respects and perhaps say a prayer. Situated 7 kms from town, the monument was built to commemorate Kruba Srivichai, who saw the hardship of the climb and initiated a plan to construct a road up Suthep Mountain to the temple and monastery. The man and therefore the monument are highly popular among the local Thais who regularly come here to make wishes. If the wishes come true, the wisher will return and present flowers or wooden elephants in thanks for the bounty provided. The temple is approached by climbing a steep Naga (serpent) staircase comprising 304 steps (however, you can also ascend by funicular railway). After Doi Suthep, the road continues to climb through pine forest to Phuping Palace on Doi Buak Ha, 22 kms from town. Phuping Palace, built in 1962, is a summer residence of the royal family, used as headquarters for overseeing development projects in northern Thai and hilltribe villages. The beautiful flower gardens (cf.Northern Route) are open to the public from 8.30am to 4.00pm Friday to Sunday and on official holidays. 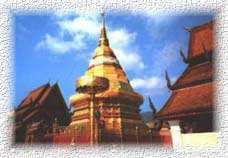 Wat Ku-Tao: the most tranquil temple of Chiang Mai, Wat Chiang Man: the oldest, dating from 1296, Wat Chedi Luang: the most impressive, and Wat Phra Sing: the most lovely. The chedi of Wat Ku-Tao was built in 1613 in the shape of five guards of various sizes beautifuly decorated with colored porcelain - representing five Lord Buddhas. 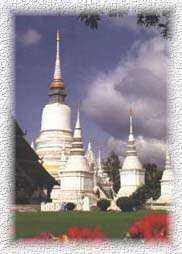 People disagree on whether the unusual chedi resembles a stack of five pumpkins or five alms bowls in ascending sizes. But one thing is for sure, behind the walls guarded by celestial lions, the main appeal of the temple is its peace as savoured under the banyan tree. Built in 1296 (the year Chiang Mai was founded), Wat Chiang Man (the Power of the City) is Chiang Mai's oldest temple - the name suggesting its importance for the early inhabitants of the city. The courtyard indeed served as residence to King Mengrai, the founder of Chiang Mai. Today the temple is noteworthy for a chedi supported by rows of elephant buttresses, and several handsome bronze Buddha images from the Lanna period inside the viharn. Wat Chedi Luang, maybe the most impressive temple of Chiang Mai, is known for its huge chedi. Built in 1401 and raised to a height of 86m in 1454 by King Tilokaraja (the founder of Wat Chet Yot), it was partially destroyed and reduced to its present height of 42m during a massive earthquake in 1545. Another feature of the site is the tall gum tree that lies just inside its entrance. According to legend, the fate of the tree is linked to that of the city : when the tree falls, so will Chiang Mai. Also of interest are a Naga (serpent) staircaise adorning the main chapel's front porch, and the framed pictures along the walls with English captions explaining the story of the Buddha's life. Wat Phra Sing, Chiang Mai's most famous temple after Doi Suthep - and probably the most lovely, dates from 1345. The temple compound includes the Lai Kham chapel with exquisite woodcarvings and murals, and a repository with striking base relief. The beautiful library is a Lanna-style building with stucco angels that convey tranquility and delicacy. Behind the viharn is a wooden bot with a stunning stucco and gold entrance. 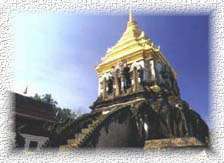 Behind is a Sukhotai style chedi built by King Pha Yu to hold the ashes of his father.